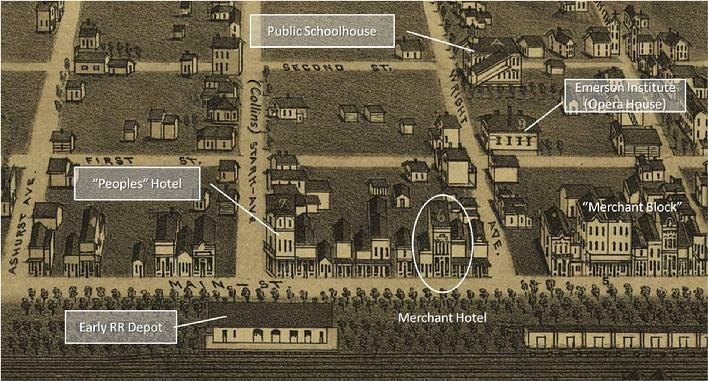 The Merchant Hotel opened for business in January 1879. Built by Henry & Philomena Yunck, the hotel continued to operate until at least 1914. 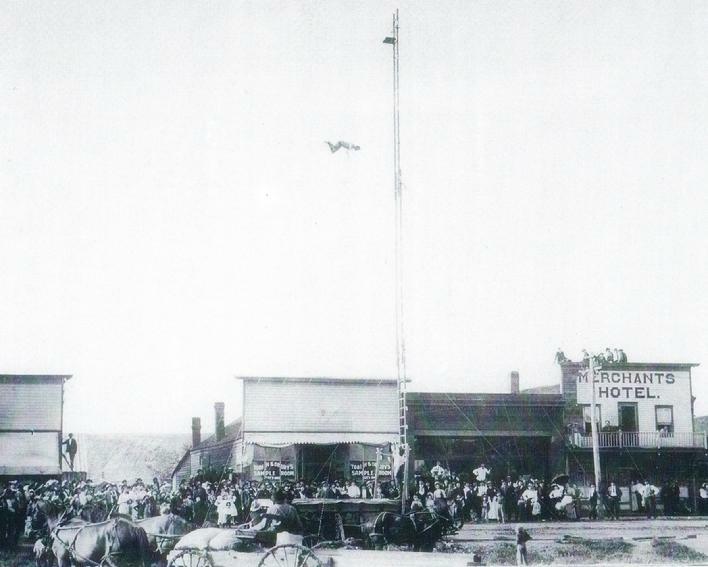 It was situated in a extremely favorable location in early Mandan, between the early railroad depot and the Emerson Institute (later expanded to become the Opera House). After the railroad moved into a new larger depot in 1882, the hotel serviced railroad workers and immigrants. Exerpt from 1883 Stoner "Birds Eye View of Mandan"
Herman Yunck had moved to Mandan in 1881. He died of epilepsy in October 1913. He was born in Richmond, MN in 1854. He was employed on various riverboats for several years before operating the saloon owned by his brother. He married his brother's widow shortly after and later opened the hotel with her. They raised a total of six children He was one of the first members of the Mandan volunteer fire department; running the Hook and Ladder Company. D.R. Taylor, Charles. Wyman, John Foran, Pat Tobin, H. L. Henke and George Bingenheimer were all pallbearners at his funeral. In February 1965, firefighters battled for 3 hours to extinguish a major fire at the site of the historical Merchant Hotel located at 106 East Main St. The fire started in the basement, and quickly spread to both adjacent commercial buildings due to high winds. At the time, its was home to Ray's Bootery, owned and operated by Ray Mosbrucker. Other involved businesses included Seb's Shoe Repair and the vacant / former Friesz Grocery building. Philomena Yunck was evacuated from the former hotel where she made her residence. The Society would like to thank Elaine Pope for sharing information on her great grandparents with us.